The Marine Mammal Stranding Center in Brigantine is caring for a young seal found wounded from a shark bite. 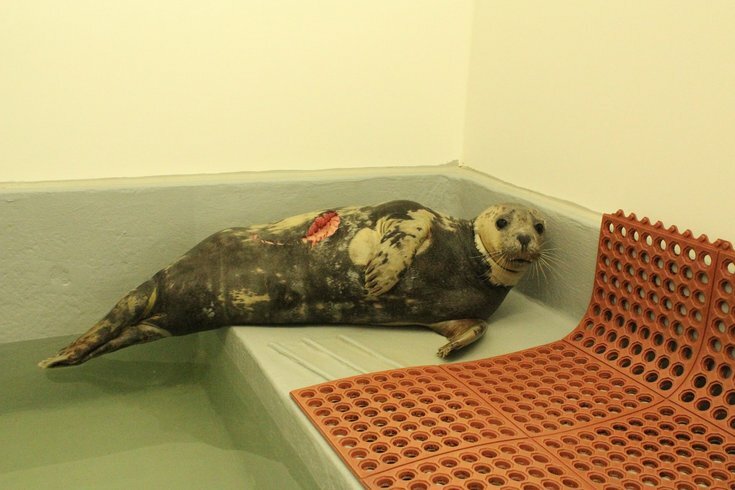 A young gray seal is now being cared for after it was found suffering from lacerations believed to be caused by a shark earlier this week. The Marine Mammal Stranding Center in Brigantine, New Jersey, said in a Facebook post that it received a call from officials at Sandy Hook Gateway Park on Wednesday regarding a yearling female who appeared "badly shark-bitten." Officials were able to treat her for "multiple wounds." It is believed to be the same seal that rangers saw in Brigantine and Sandy Hook throughout the summer. The seal will be held and treated until she is ready to return to the ocean, which could "take several months." Donations to the organization for food, treatment or repairs to its seal room, which they are in the midst of and recently found to be "extensive and costly," are encouraged.